A wonderful weekend for Lytham St Annes Ladies saw them move ahead in the title race with a dramatic derby win over Fylde 2, while the second team secured promotion for the first time ever. LSA’s senior side were billing their AKS clash with North Division Two north west leaders Fylde 2 as the biggest in their history. Defeat would dash their title hopes but a 2-1 win was sealed with seconds remaining. Two strong teams took the field and Lytham’s early pressure was rewarded when Grace Webster ran down the right before beating the keeper for the opening goal. Spurred on by this dream start, LSA had the better of the first half, driving down the wings. Fylde came out of the blocks very strongly in the second half. Lytham defended strongly but it was never long before Fylde won the ball back. They equalised from a short corner but LSA’s heads did not drop, and when Hazel Cockerill forced a mistake in the Fylde defence, Tasha Webster slid the ball across for the calm Jasmine Carey to notch the winner. The win lifts LSA two points above Fylde and means that victory away to bottom club Windermere on Saturday will seal both promotion and the title. Lytham’s player of the match award was shared between the whole team and all the players thanked the spectators for braving the weather to support them. See below for Fylde details. LSA 2 secured the Lancashire Central division one title with a 4-1 win over Blackburn and Clitheroe Northern 2 at AKS. Lytham pressed hard from the start despite the torrential rain and Jess McIntyre scored the only goal of the first half following a rebound off the keeper. Southport scored on the break in the opening seconds of the second half but LSA came back even stronger as Anna Tankard scored two quick goals to put the home side back in the driving seat. With superb support from the sidelines, Lytham sealed victory when Harley Greened smashed in the last-minute fourth. Lytham face second-placed Southport in Saturday’s final match but can’t be caught and the team celebrated in style. Lytham Men expected a tough game in testing conditions at Windermere in North Two West and got exactly that, losing 11-2. The Cumbrians pressed high and were four goals up after 20 minutes. LSA got a foothold and a lifeline with two Dowbiggin goals, the first set up by Dixon, to make it 4-2at half-time. But Windermere came out flying for the second half, despatching their short corners clinically. LSA had further chances, hitting a post, but this was a disappointing day ahead of Saturday’s final home match against Didsbury Northern 2. LSA 2 also faced their Windermere counterparts and drew 1-1 at AKS in North West five north north. The first half saw LSA lose a goal to a drag-flick and Steve Poole to a head wound. But with the elements in their favour in the second half, Dave Gee equalised and Lytham proceeded to dominate, with man of the match Joe Ashton and Dan Thompson strong in the middle. However, LSA could not convert their penalty corners and had to settle for a draw, though LSA are now almost certainly safe from relegation with two to play. 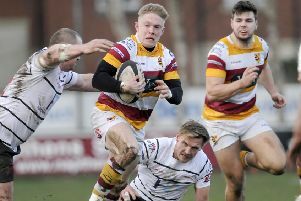 Fylde Men bounced back from a disappointing defeat with an emphatic 5-0 win over Deesider Ramblers in their final home game of the North West Division Two season. Jack Cropper made his first appearance of the season as Fylde consolidated second spot, with man of the match Oli Santamera opening the scoring. It was 2-0 at half-time after Rob Jepson’s superb solo goal. His twisting run ended with a ball across goal going in off a defender. Fylde continued to dominate, increasing their intensity and their lead when James Oakes unselfishly set up top scorer Chris Toward for a tap-in. Toward soon doubled his tally, firing home from a penalty corner, and captain Simon Major completed the scoring after a strong run by Chris Holman. Fylde remain three points behind leaders Timperley 2, who they face in their final match in a fortnight. The Saturday brings a derby trip to Preston 3, when victory for Fylde will secure a top-two finish and promotion. 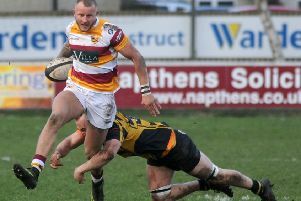 Fylde 2’s final away fixture in North West three north brought a 5-0 defeat at Bury. The visitors held their own for 20 minutes but fell behind from a short corner, despite a fine initial save by Luke Whitelow. Bury were two up by half-time and added three more, the last smashed into the top corner from 12 yards. Ryan Nicholls and Duke Jones stepped up from the thirds and held their own, while Whitelow was named man of the mach on his debut. Fylde 4’s game at Kirkby Lonsdale was rained off. Fylde Ladies faced the full force of Storm Hannah and Ben Rhydding Ladies at Mill Farm, losing their Conference North encounter 3-1. Both sides struggled with the conditions and the visitors took the lead from a well-worked short corner. Fylde started to put some promising passages of play together, though the West Yorkshire club doubled their lead from another short corner before Sophia Crawshay scored on the counter to make it 2-1 at half-time. Fylde went straight on the offensive after the restart and looked the likelier scorers of the vital next goal. However, Ben Rhydding scored it with a few minutes left to leave Fylde deflated. Fylde 2 conceded a last-gasp winner away to Lytham St Annes, which looks likely to cost them the title (see above). The home side replaced Fylde at the top of North Division Two North-West with a 2-1 win at AKS in this penultimate match of the season. Lytham scored an early goal and dominated the first half but Fylde came back strongly, pinning LSA in their own half for long periods of the second half. Hannah Mears equalised late on from a penalty corner and looked to have done enough to retain top spot but a defensive error led to the LSA winner with just seconds left. Fylde complete their season at third-placed Formby on Saturday. Fylde 3 earned a 1-1 draw away to promotion rivals Lancaster and Morecambe, who started the day top of the Lancashire Central premier division. Both sides had won a match in this season’s previous two encounters and this was always going to be a tense encounter. After a goalless first half, Rucky Mahmood’s delightful touch gave Fylde the lead. Bo Madden and Hattie Madden worked hard up front, while Gemma Eastham and Amy Merrick impressed down the right and Pippa Rogerson stepped up on her debut. Lancaster equalised but Fylde battled for the draw as player of the match Dani Merrick made some excellent tackles. It meant Lancaster lost pole position to Longridge 2 and Fylde slipped to fourth, just two points off the top, ahead of Saturday’s final match away to Garstang 2. Fylde 4 continued to climb in division one with a 2-1 home victory over Leyland and Chorley 2.